This entry was posted in government, media, politics, Quotations and tagged ABC, Disney, Fox News, Frugal Dad, GE, media consolidation, NBC, news, News Corp, newspapers, television news, Thomas Jefferson, Time Warner, Viacom. Bookmark the permalink. 7 Responses to Well Informed Citizenry? Arlen Grossman, those on the Left do not want a well informed citizenry. Those on the Left want to turn us into mindless zombies. Nonsense, Jeffrey. Are followers of Fox News, Rush Limbaugh, etc your definition of well-informed citizenry? Arlen Grossman, I like Mark Levin, Rush Limbaugh and Michael Savage. 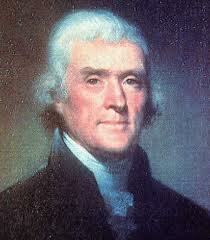 I wonder if Jefferson would rethink his position if he were alive. With 6 media companies controlling 90% of all media, we are only 5 mergers away from having a Soviet-style media monopoly.